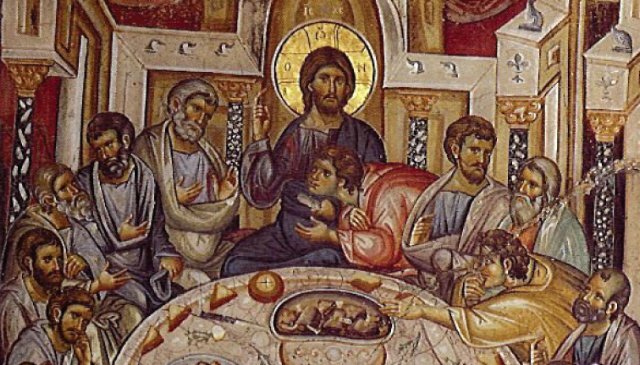 Fr Aidan over at Eclectic Orthodoxy is in a wonderful series on the Eucharist, not a subject on the top of the list for most Evangelicals. It would be nice to see that change since so much of our larger cosmology and beliefs about divine-human relationality (even re: the eschatological destiny of creation) can be manifest in how we view the bread and the cup of communion. I’ve posted my thoughts to a particular post of his and thought I’d put them up here as well. But you’ll have to read his post to get the context of my comments. As I understand what Fr Aidan has shared, I’d want to say that what he describes as becoming true of the relationship between the glorified humanity of Christ and the bread and wine in the Eucharist, is in my view already true universally, so that in the Eucharist we are celebrating what is everywhere true and not what becomes true on occasion. I’m open to changing my mind, but that’s where I am at present. Everything he says about the union of the world in Christ’s resurrected humanity as ‘occurring’ in the Eucharist I’d want to say occurs universally as a consequence of Incarnation/Resurrection and that the celebration of the Eucharist is where and how we declare “here and now” what is in fact true everywhere. But this means the entire created order, via Incarnation, really is Christ’s body—now. The Church is where that body gets steadily transformed into the full exercise of its God-given capacities for relationship with God. Why isn’t the whole universe now as immortal and gloried as Christ now is? Good question. I think the answer may be because in the end the universal body that Christ seeks is the concrete union of hypostatically (‘personally’, if I may) distinct others. This means the glorification of the rest of the material order awaits the hypostatic (personal) surrender of all human beings. When we are sufficiently defined in our own personal reality by the transcendent reality of Christ’s risen presence, glorification follows. It’s not that we then ‘become’ his body (which nobody is actually saying); it’s that our understanding and perceptions of ourselves catch up to the truth of his already abiding presence, and the increasing vision of Christ comes all-defining. In short, the Eucharist is a celebration where we declare this to be so, not an event which achieves a divine presence not already the case everywhere. God is not more present in creation when Incarnate than God is present in sustaining things generally. Rather, in Christ creation becomes uniquely (hypostatically) present to God (which is not the case with God’s sustaining presence in the world generally). It is this hypostatic/personal presence of creation within God that brings creation to its fulfillment. But this fulfillment already achieved as Christ is the truth of all things presently. So though we can make a distinction between God’s sustaining presence in the world and God’s incarnate-hypostatic presence, these are coterminous realities. The distinction, as I understand it, is that where the sustaining presence of God is fully realized asymmetrically in our mere existence as such, our hypostatic/personal mode of our existence is a transforming work of synergy, a free participation by us in the Incarnate reality of Christ. The bread and the wine are how we recognize and celebrate the universal truth of Christ’s presence in all things and in celebrating it increasingly transform our vision of things. “Glorification,” then, is when both the sustaining presence of God that gives us being and the hypostatized presence of the Incarnate One are indistinguishable in their effect. This entry was posted in Transcendence and tagged Eucharist. Hope you don’t mind, Lewis, but I used your question as an opportunity to reflect a bit on it as a separate post (4/16/2018).